Dairy Derived Protein Blend (Milk Protein Concentrate, Calcium Sodium Caseinate [Milk], Whey Protein Concentrate [Milk], Whey Protein Isolate [Milk], Whey Protein Hydrolysate [Milk]), Maltodextrin, Non Dairy Creamer (Sunflower Oil, Maltodextrin, Sodium Caseinate [A Milk Derivative], Mono- and Diglycerides, Tocopherols), Natural And Artificial Flavors, Potassium Chloride, Soluble Corn Fiber, Medium Chain Triglycerides, Canola Oil, Magnesium Oxide, Acesulfame Potassium, Potassium Bicarbonate, Sucralose, Lactoferrin [Milk]. MUSCLE MILK PRO SERIES® Protein Powder can be used either before or after workouts, for a snack, or prior to bedtime. Mix 2 scoops (82g) MUSCLE MILK PRO SERIES® Protein Powder into 10-16 fluid-ounces water for a great tasting supplement. You can also supplement your pancakes, smoothies or other recipes to increase the protein content by adding MUSCLE MILK PRO SERIES® Protein Power. MUSCLE MILK® products complement sound nutrition and hydration practices that, in conjunction with a smart exercise-training program, may contribute to recovery from exercise, gains in lean muscle mass, and weight management. Use as part of a well-balanced diet that includes whole foods and other protein sources. Quick digesting protein builds more muscle while you workout. Slow digesting proteins will steadily feed your muscles throughout the day. This product contains no added fillers or unknown substances. CytoSport is back in action with a new product called Muscle Milk Pro Series 50. 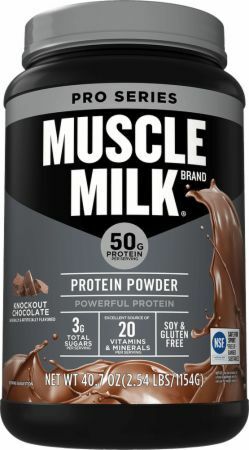 This product was designed to be a step up for the original muscle milk except with fewer calories and a newly formulated proprietary blend of protein, packed with vitamins and minerals. Each scoop of Pro Series 50 contains 25 grams of protein. This high quality protein blend combines quick and slow-release proteins to deliver the maximum amount of muscle nutrition before and after exercise. Quick digesting protein can cut down on soreness. With the slow digesting protein provides extended muscle recovery throughout the rest of the day. Pro Series 50 is optimized with only 150 calories for individuals with low caloric diets and others that are on strict training regimes. This is formulated with 20 essential vitamins and minerals to maintain general health. Along with being gluten free, this product contains no banned substances or added fillers.